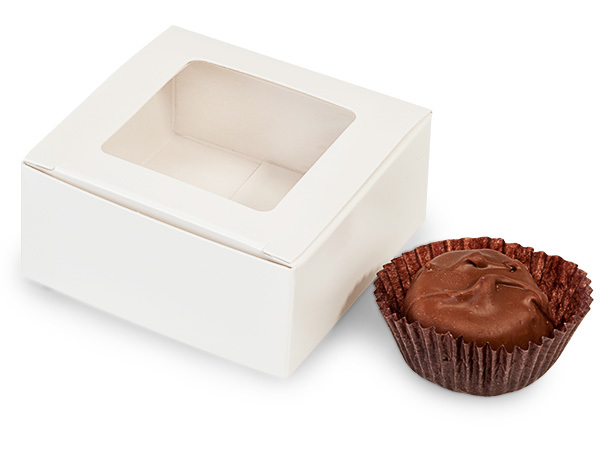 White window candy truffle boxes perfectly hold 4 truffles. These boxes are perfect for wedding favors, and basket fillers. Made in the USA. Add Twine to Your Boxes! These 1 Piece folding candy boxes will make beautiful packaging for your truffles, candy and fine chocolates. These truffle boxes make the perfect favor boxes for your wedding or party, or for small add on sales of your gourmet candies. We have a wide range of colors to match any theme! Our small truffle box will hold two regular sized truffles, while the larger box will hold up to 4 truffles. We even have a window option on the larger size! These boxes store flat and are easy to fold! Our truffle boxes comply with FDA regulations for food packaging and are made in the USA!